SMiRT 15 is organized by Korean Nuclear Society in cooperation with Korea Electric Power Corporation (KEPCO), Korea Atomic Energy Research Institute (KAERI), Korea Institute of Nuclear Safety (KINS), Korea Earthquake Engineering Research Center (KEERC), and Safety and Structural Integrity Research Center (SAFE). 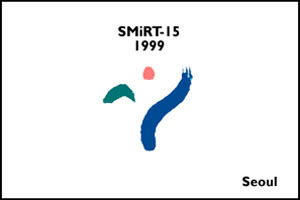 Various Korean professional societies and institutes actively take part in organizing SMiRT 15. Eleven major Korean industries and many other corporations are sponsoring SMiRT-15. The advisory committee provides counsel and guidance to other committees on various organizational matters. The supporting committee provides general financial support. The organizing committee coordinates and directs activities of other committees. The scientific committee and the executive committee are the main body of local organization responsible for conference organization, technical program development, editing and publication of the proceedings, support service and the financing of the conference. All members in each committee devote themselves to organize a successful and enjoyable SMiRT conference.